I was walking room to get my homework to turn into my teacher when I heard a strange noise. I opened my bedroom door I was surprised by what I saw. I saw my pug, pee on my favorite shirt, my pillows on the floor and the pole in the closet knocked down also my clothes pulled down with it. I was so cross that I yelled at my pug so loud that he ran out of my room whimpering. It took me ten minutes to find him and when I did he was under my mom and dads bed. 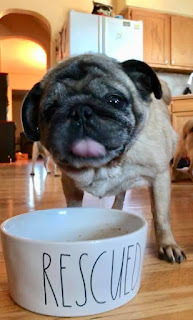 Rescuing Pugs This is the story of we started fostering pugs and how it transformed our lives. It wasn't planned and that is what is so great about it. I always wanted a pug. On my seventh birthday, my parents told me that I could get one. I got very little presents that year, but I was okay with that because I knew that I would get a pug soon. My parents said we had to wait for the right one to come along. The problem was, the right one didn’t come alone for at least a year and a half. I was 9 years old before I got my 7 year old birthday present. Josephine loves pugs and always fosters them. She also loves rodents. She grew up with many pets. The Teacher Kid Life: Teacher kids of Glenridge Elementary School 2018. We did a unit on journalism. This is my news story on teacher kids. Teacher kids. What are they? A teacher kid is student that has a parent who teaches at the same school you go to. Being a teacher kid means you have to get good grades and be on your best behavior. There are many teacher kids at Glenridge Elementary in the 2018-2019 school year. Teacher kids have some advantages. Like Tyson, a student from Glenridge Elementary School. His mom is a reading teacher. Tyson can get special help with reading since his mom is a reading teacher. But there are some disadvantages. Like Evelyn, another student from Glenridge Elementary. She is always stuck in the classroom before and after school. One huge advantage that all teacher kids have is that your mom is off during the summer. No boring camps or babysitters for teacher kids!